In 2 days (Thursday, August 1st), the Chicago shopping scene will be changed forever. 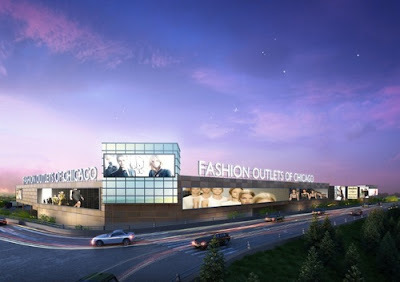 Just over the border of the City, the suburb of Rosemont will welcome an indoor outlet mall. This shopping oasis is right by O'Hare Airport, one of the busiest transportation hubs on the globe. A lot of things will make this place special, but here are just a few. 1. It is an indoor outlet mall. All of you true fashionistas know, outlet malls are great, but even better in the summer. They are typically outdoor destinations. Sure shopping in the midwest is done all year, but the Fashion Outlets will make it even sweeter in February by providing a roof. This is major--trust me. It's great deals all year round, in a climate controlled setting! 2. It's steps away from the airport. 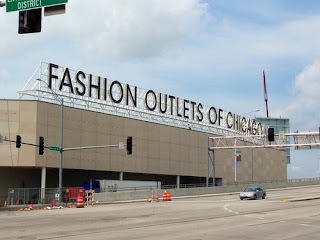 When coming and going to Chicago, you can stop by the outlets and even check your bags while you shop. It couldn't be more convenient. 3. Bloomingdale's will be there. Luxury fans are excited. Bloomingdale's is at the pinnacle of fine shopping, and with brands like Louboutin, Michael Kors, Chanel, and more, shoppers are excited to see this retailer at an outlet mall. 4. Art will be everything here. Artistic expression will be a major factor at Fashion Outlets of Chicago. Where many malls keep their decor fairly simple, this one takes it to the limit. There's bright colors, spotlights on local artists, and a scene to keep your attention. I can't say enough about the art that'll be there. Take a look and check out the artists making it so breath-taking. Daniel Arsham, Jen Stark and Jim Drain of The Arts Initiative are just some of the artists styling the hallway of Fashion Outlets of Chicago. 5. There's shopping at all price points and styles. Fashion Outlets of Chicago will have 130 retail outlets, and literally something for everyone. We've gotten you excited about Bloomingdale's but the Outlets will have everything from Forever 21, to BCBG, Gap, Coach, Nike, and so many more. Here's the full list of stores. Can't wait!